How to take a great photo of your dog – and share with us on Facebook! Trying to get a good photo of your dog can feel like trying to catch the perfect wave. You try to seize the moment, but your dog jumps out of frame the minute you snap. Fortunately, creating a keepsake photo of your pal is possible. With a little persistence, you might even capture a shot worthy of your holiday card. Here are a few tips for capturing an Instagram-worthy photo of your dog. Start with the basics. Morning and evening light are softer and will enhance any photo. Natural light is better than indoor light unless you have professional lighting equipment. Avoid photos with the sun in the background because what you will get will be a silhouette, not a natural-looking image. Now for the tougher topics, like getting your dog to sit still. 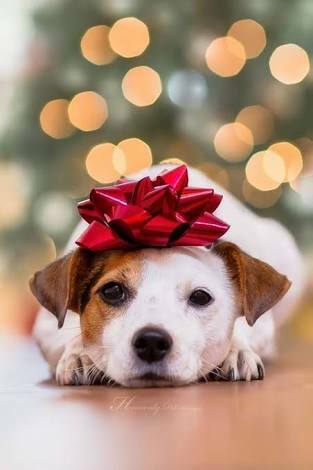 You can recruit a friend or family member to hold a treat or toy out of the camera’s view and behind you to encourage your dog to look at the camera. Exercising your pet before photo sessions also may make them more likely to stay calm and cooperate. Give your dog time to get used to the camera, especially if you are using a flash. You may want to let them sniff it first. Taking lots of photos can help your dog feel comfortable and increase your chances of capturing a memorable photo. Consider different backgrounds. A white dog may stand out more amid outdoor greenery than if posed against white walls, for example. Try different angles. Many people shoot down on their dogs. Why not get on the floor and shoot up, or from the side? A closeup of your dog’s snout or paws may be a fun photo. So start snapping and share your photos on our Facebook page.